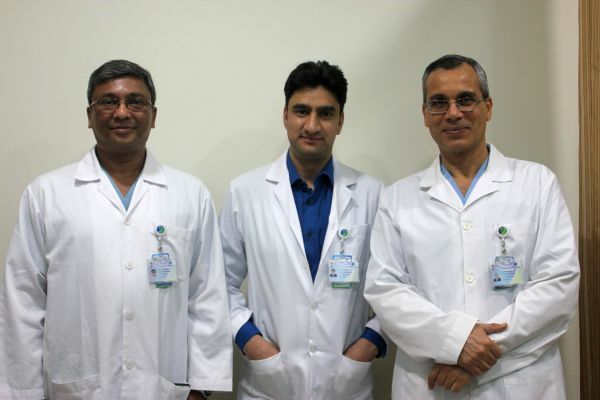 Caption: The team of doctors who carried out the surgery at Zulekha Hospital Sharjah: Dr Arindam Dutta, Specialist Anaesthetist; Dr Sajad Ali Mohammad, and Dr Mamdouh Abddu-El-Moety Maged Mohamed,Consultant Anaesthetist. A team of surgeons at Zulekha Hospital Sharjah successfully removed an enlarged 18cm gallbladder from the abdomen of a UAE resident, who had suffered from acute stomach pain for more than a year. The four-and-a-half hour operation was performed on a middle-aged female patient who had been experiencing excruciating abdominal pain which made it difficult for her to walk or straighten her back. Prior to her appointment at Zulekha Hospital, the patient, who wishes to remain anonymous, had consulted clinicians at several other local hospitals where she received treatment for minor stomach ailments and other acidity-related problems. Performed by a team of expert clinicians, the operation revealed an abnormally enlarged and inflamed18cm long gallbladder with thickened walls that prevented the doctors from performing a standard laparoscopic surgery. Gallbladders are normally 7-10cm in length. Dr Mohammad said: “On average we operate about 300 cases of this disease every year with the use of procedure known as laparoscopic cholecystectomy. Conducted by a surgeon, two anaesthetists and nurses, the surgery involved doctors making one large incision to remove the swollen gallbladder and several stones, with the largest one measuring 6cm in diameter. According to international study “Gallstones: A Worldwide Multifaceted Disease and Its Correlations with Gallbladder Carcinoma” published this November by Public Library of Science, gallstone-associated illnesses are among the most frequent diseases in the UAE and India and are thought to result from environmental conditions and dietary habits prevalent in this part of the world.